The CV7A10.BA0795 TAG Heuer Carrera Calibre S Laptimer Men’s Watch is a versatile and sophisticated watch that comes in a variety of styles that will suit anyone’s preferences. 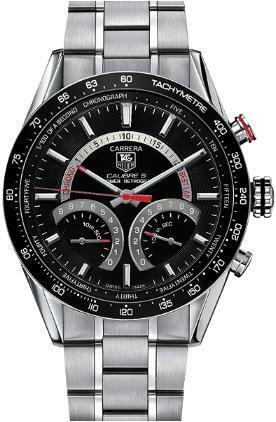 The TAG Heuer Carrera Calibre S Laptimer comes in four distinctive styles, based on face color and bracelet choice: it comes with either a black or white face, and can have either a fine-brushed and polished steel bracelet or a black perforated rubber strap with embossed “TAG Heuer.” It features a 43 mm sandblasted titanium grade 2 case, fixed black aluminum bezel, and scratch resistant sapphire crystal. The watch is dive resistant to 100 meters. The most notable feature of the TAG Heuer Calibre S Laptimer is its dial. It features a flyback chronograph that has accuracy up to 1/100th of a second. The three hand applied semi-circular counters each clocks a different function: 12 o’clock is a lap timer with the Chronograph mode indicator displayed at 9:30 and the Best Lap mode indicator at 2:30; 4:30 displays a 1/10th of a second retrograde counter; and 7:30 displays a 1/100th of a second retrograde counter. The hour, minute, and counter hands are all polished and feature red extremities. Each hand is also luminescent with the exception of the second hand. A refined and spirited watch, the CV7A10.BA0795 TAG Heuer Carrera Calibre S Laptimer Men’s Watch oozes urbane charm and makes a fantastic addition to any man’s collection. I cannot find this watch anywhere in the US … what’s the deal? When was this watch released? What’s the retail price? Info..info..info! What is the retail price for this specific Tag with the black rubber strap? the retail for ths watch is $ 2150 ….